Posted on August 7, 2012 by Brandrenaline, Inc. Believe it or not, NASCAR racing is not an Olympic sport. 3) there is a big prize – a significant reward for winning and devastation for losing. Both NASCAR and the Olympics have great competition and world-class athletes. Millions are invested on sponsorship and there’s plenty of live television coverage. There are however, some differences. Imagine training for four years, getting the opportunity to compete at the Olympics, and then falling off the balance beam, or finishing 4th in your race by 9/1000ths of a second… and getting nothing. In the Olympics, if you finish 4th – or worse – you get nothing. And, some sports, like women’s gymnastics, are very difficult to come back to in another four years. The US women’s gymnastic team has not had a team member return for a second time for the last three summer Olympics. So, 4th or worse?… you then must wait, and continue to train, for four more years. Then you must re-qualify for the team, before you can try again. That’s tough. And most people can relate to this. High stakes indeed. In NASCAR’s biggest event in 2012 – the Daytona 500 – David Ragan crashed on lap 1, finished 43rd and collected $267,637. He packed up and got to try again one week later. The Olympics don’t have that. 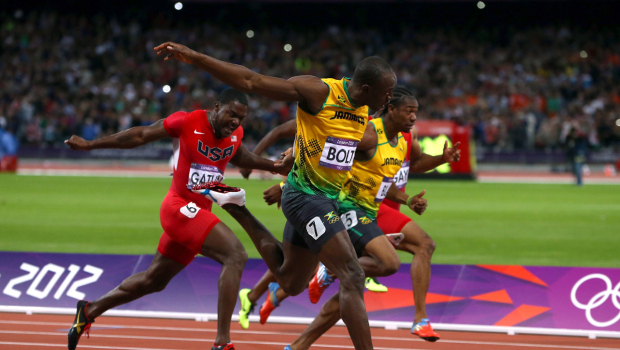 The Olympics invented the concept of ‘go or go homers’ with many of their events being ‘single elimination’. In other words, if you lose, you go home… but the Olympics definitely do not allow ‘start and parks’. In NASCAR, there have been 21 races so far in 2012. Of those 21 races, Josh Wise has entered 20, qualified for 19, and parked it in 18. And in the one race where I think he might have actually been racing (Richmond), he crashed about 1/3 into the race and collected over $70,000 in prize money. To date, there have been 5,746 laps run in NASCAR Sprint Cup. Josh Wise has completed 850 laps… or 14.8%. Josh Wise has collected $1,516,570 in prize money…. so far, this year. That’s $1,516,570 in prize money even though he showed up at these ‘professional’ sports events with “Quit” as an action item on his to-do list. In the official results on the NASCAR website, beside Josh’s name for each event, oddly, they do not list “I quit” as the reason for him “quitting”. They blame this on his team and his crew and ‘all the guys back in the shop’ when they use words like “Vibration” (6 races) and “Brakes” (6 races) to lie to us about why he quit. In fact, Algerian runner Taoufik Makhloufi pulled a “start and park” in his 800 meter race. He had qualified for the 1500 final, and did not want to hurt his chances by running the 800. So, he started… then quit…. and was immediately kicked out of the Olympics. This came after four badminton teams had been tossed for purposely trying to lose their matches to get ‘easier’ draws. Of course, this is not about Josh Wise, and it is not his decision to “quit”. His team owner makes that decision, with NASCAR’s ‘system’ being the enabler. I think Josh is probably a fine racer and feels sick about what he is doing. But, a guy’s gotta eat right? In NASCAR, in qualifying, when one of the “go or go-homers” gets locked into the race, Mike Joy or DW will announce VERY excitedly…. “And Josh Wise WILL race tomorrow….” even though in actual fact; no…. he will not race tomorrow. He will “start… then quit” and his team owner will get about $75,000 for him doing so. In NASCAR, the top athletes travel to their next event in their own private jet. In the Olympics, the top athletes have to book time off work – both for training and to compete in the games – and then most of them must return to work after the games, gold medal or not. Of course, there are exceptions, but in general terms, most Olympic athletes are truly amateurs. Which scenario is more relatable? Of course, this comparison between NASCAR and the Olympics is not ‘apples-to-apples’. In fact, they are not even close. NASCAR encourages and rewards mediocrity, and insults the audience about the purity of the competition. Furthermore, NASCAR blames the economy for their empty seats. If this was true, why aren’t TV ratings – in fact – rising? Why aren’t all of those “diehard fans” that cannot afford the gas to drive to the races watching at home, on TV – for free… resulting in all-time-high TV numbers? “Television ratings for NBC’s prime-time block were, by far, the early story of the Games and exceeded the most optimistic expectations. NBC averaged 35.6 million viewers through the event’s first five nights, putting the London Games on pace to become the most-watched Olympics in history. I think that NASCAR probably wishes that they had strength in all three sides of my success triangle. Why wouldn’t they? What continues to bother me – and this is true in ALMS, Grand-Am and IndyCar as well – is that they are not taking big enough swings at change. They continue to do the same things over and over and over…. and then ‘hope’ that the sponsors and audience will come back. They are not coming back until you change things, and until you do, the Olympics will continue to capture the audience, the sponsors and the cash. One change the Olympics made – a big swing if you will – was to have the games take place every two years. From a sponsorship and audience perspective, I’d say that was pretty clever. As the great visionary Frank Zappa once said…. This entry was posted in Rants! and tagged "Frank Zappa", "Josh Wise", "Olympic Games", business, motorsports, NASCAR, NBC, Olympics, racing, Sprint, Sprint Cup, Stremme, Zappa by Brandrenaline, Inc.. Bookmark the permalink. Very well put as usual Jim, when you utilize your success triangle to compare any race series to other sports properties- it becomes obvious that big changes are much needed. To take your blog topic further- what would an Olympic “motorsport” event look like? How would athletes qualify and compete and what would this mean to the greater motorsport community? Well, I think it would look a lot – or exactly – like the Race of Champions. I do not think it would change with the motorsports community much unless the racing series’ change. Olympic athletes compete many times a year in other events…. but when it’s the Olympics, the prize changes…. so everything else changes too. You are right on target with this. I was not aware of the “start and quit” with some teams. It’s totally counter to the sense of competiting and giving your best to win. Thanks Pat. Last weekend at Pocono…. there were 10 cars that started… then quit. The foundation of this particular mess is that NASCAR has to start 43 cars as per agreements with tracks. Who knows what else is going on to fill the ‘starting’ grid. You too…. have a great week. I will, however, argue slightly regarding “start and park” in the Olympics. I was very in tune with live coverage over the long weekend, and what I was surprised to learn is that in some sports, mainly triathlon and other forms of cycling and long distance running, that most countries don’t neccessarily pick the “best” athletes to compete. The topic came up while I was watching a recap of the women’s triathlon. Great Britian team consisting of Helen Jenkins(5th), Vicky Holland(26th), and Lucy Hall(33rd) (finishing position in brackets). Lucy Hall swam very strong and in fact was the first to come out of the water, over a minute ahead of Helen Jenkins, Great Britian’s strongest medal hopeful for the event. Jenkins would catch Hall rather quickly on the bike, with Hall falling back positions for the duo to lock up. The 2 raced in the lead pack for the reamaining laps of the bike portion of the event and would finish this section in 9th (Jenkins) and 22nd(Hall). Hall fell 21 spots from the lead after the swim, but only 5 seconds behind Jenkins at the end of the bike. However, the real story, Jenkins was over a minute behind the leaders after the swim, and now she was only 4 seconds behind the leader after the bike. Hall would go on to jog the running portion and she finished 33rd, 4 minutes and 50 seconds behind the leader. Jenkins would go after the podium but finished 5th, 31 seconds behind the leader, and 29 seconds out of a medal. The race took approx 2 hours to complete. Now, what was most interesting in this race was the commentators…. They followed Hall and Jenkins pretty close throughout the first 2/3rds of the race…. and then we lost sight of Hall in the run. So, for the breakdown, the commentators mentioned during the swim that Hall was on the team for one reason and one reason olny, and in fact they made mention to the fact that Hall was “hired” to compete this event. Hall was there to set the pace for Jenkins in the swim, and keep Jenkins on pace and act as a draft partner for the bike portion giving her a shot to start even with the leaders for the running leg. Hall did her “job” and then parked. Watching more events, especially running and cycling, I would hear more and more about pace setters and drafting partners. You would even see in some instances runners drop out of long distance races 3/4 of the way after running at the front. On another note we even saw a runner in the 800m event completely drop out, and then encourage the other competitors from the sidelines halfway through the race as they ran by him. (Not sure what country this individual was from). The commentators said the reason was that his country forgot to drop him from entering the event before the deadline so he had to run this event, even though he was there to compete in a different distance (1500m I think). But now he is under review and may be kicked out of the games altogether. This, of course, comes after the badminton controversy. I know, totally different then what we are discussing here. But back to my point, in the womens triathlon we essentially some some start and parks… Maybe I’m taking the wrong approach here to your point. And I don’t discredit your point at all. It is very valid. However, to me this was upsetting to watch, especially for Hall, and whoever’s spot she took on the team, who could have been a real competitor for a medal. Okay, re: Hall. 1) She didn’t buy her way on to the team. 2) I am sure it was a GBR Olympic Committee decision to give GBR the best chance for success. 3) Each country is allowed to send who they want. Re: the dude that quit the 800 – and ping-pongers. I reference both in my blog story – check it out. The 800 dude did get booted. Re: the Canadian Triathlete Simon Whitfield – he had a ‘partner’ that did this as well. Again, an Olympic Committee directive designed to give us the best chance for a medal. So, I agree that there are similarities to “start and park”… but, I think that the “greater good” strategy trumps it. There is no “greater good” in NASCAR’s ‘start and quits”…. Thanks for taking the time Joey! Overall, you are right, there is no “greater good” in NASCAR. And the sport is in real trouble because of it. Look at the fans in the stands; more importatnly the one’s who aren’t. The Olympics is the 2nd largest brand. There’s a reason for that, in which you elude to in your blog post. Great post Jim, one of the better reads I’ve had in a while. Hold on here… “NASCAR insists on starting 43- cause the track promoters insist on it”… I highly doubt that’s a deal breaker to get a race these days… So what’s the real reason they continue to start and quit the 43?? ?